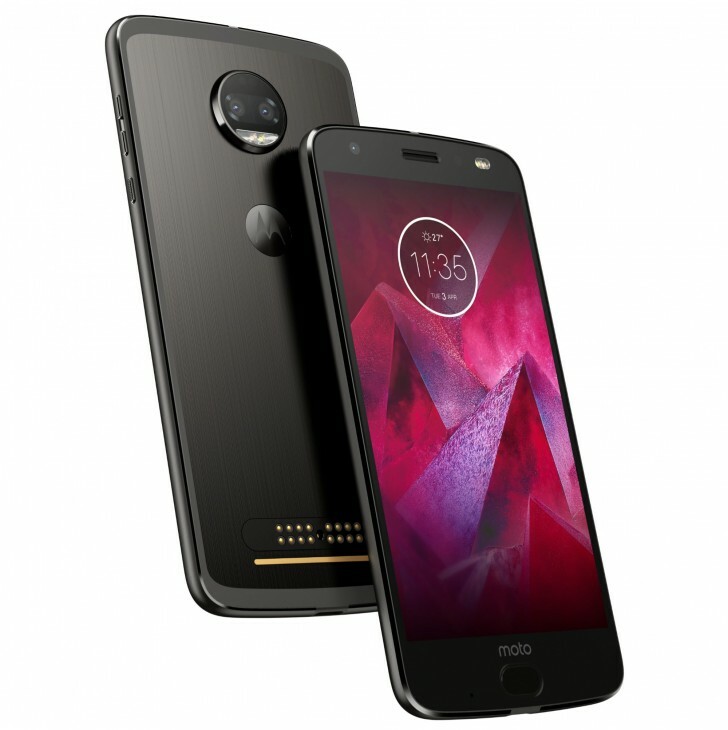 Motorola has finally announced the Moto Z2 Force Edition. The phone is up for pre-order in the US starting today across all major carriers and will be available in Mexico, Brazil and other countries in Europe, Middle East and Africa later this year in summer. The phone will be available in Super Black and Fine Gold, along with a T-Mobile exclusive Lunar Grey. The Moto Z2 Force Edition features a 5.5-inch Quad HD POLED display with ShatterShield, which is a layer of shatter resistant coating on top. The phone also features reinforced 7000 series aluminum for added rigidity. On the back of the phone is a new dual camera system, consisting of two 12 megapixel f2.0 cameras. One of the cameras can capture full color and the other is monochrome. The phone uses both by default to produce still images but can create a shallow depth of field effect using the monochrome camera as depth sensor. You can also capture monochrome images using the second sensor only. There is PDAF, laser AF and 4K video but no OIS. Other notable features include Qualcomm Snapdragon 835 processor, 64GB expandable storage, 4GB RAM, 5 megapixel f2.2 front camera, dual SIM in select markets, NFC, dual band Wi-Fi 802.11ac with MIMO, Bluetooth 4.2 with 5.0 support coming with Android O update, USB-C for data and audio (no 3.5mm headphone jack although an adapter is provided), water repellant nano coating and Android 7.1.1 Nougat. The battery capacity has been reduced from 3500mAh to 2730mAh on the new model. You still get a 15W TurboPower charger. The phone has full support for Moto Mods, including all of last year's models and the new ones announced this year with the Moto Z2 Play. Motorola also announced the 360 Camera Moto Mod, which records can record 360-degree 4K video with 3D audio. The video can be edited on the phone and even live streamed directly. The 360 Camera Moto Mod is priced at $299 and will be available starting August 10. Doesn't look like up to competition with gimmicks all other without any use, mods don't give you much value, when phone cost arm, going LG G5 way Lenovo?